There are a number of ways to “wire the stage,” and as long as the methodology produces a reliable result, along with being both safe and efficient, then it’s all good. Over three-plus decades, I’ve developed and refined a consistent approach that my company employs, which I’ll detail here. First up is AC power for the main and monitor systems. On larger shows, there’s probably a primary feeder cable delivering power via a venue’s company switch or a generator that runs to a power distribution (PD) unit. Make sure a qualified show electrician puts together the AC infrastructure, and always test the power before connecting any gear to the PD (even if the electrician says it’s a go). On smaller shows, the PA and stage might need to be powered via electrical outlets in the venue. If it’s an unfamiliar venue, first locate the breaker box and determine the connections. It’s not uncommon for multiple outlets to be linked a single breaker. A tool called a circuit breaker finder can be used to identify the circuits. This tool consists of two units – a transmitter that plugs into the outlet and a receiver that indicates the correct circuit as you pass it over the breakers in the box. No need to open up the breaker box. Make a chart of the outlets and their circuits in order to make sure than no outlets are overloaded. Again, test all power before plugging in any gear. Usually, stage power for the band (and its instruments) is the audio department’s responsibility as well. For gigs with a rider from the band, we run the power per the stage plot, while for non-rider (and festival) dates, we utilize a backline string with two to three circuits upstage so any amplifiers can easily plug in. It’s also a good idea to have at least two 50-foot extension cords with quad boxes on hand and ready to go if power is needed for things like guitarist floor pedals and/or keyboards set up downstage. On outdoor gigs in our hometown (Reno), any stage power circuits are GFI circuits, which is required by local codes. Always check the local power codes in your area. Another thing to keep in mind: with corporate shows/events, always run power service to the podium and any client work areas backstage. Labeling cables speeds the process while lessening the chances for mistakes. The National Electric Code (NEC) calls for Extra Hard Usage (SO) AC cables to be used areas where they may be subjected to physical damage, such as where people walk or carts roll over them. For locations where they’re not subject to physical damage, Hard Usage (SJ) cables can be used. My company carries both types of cables in our inventory, and to make it easier for stagehands unfamiliar with the differences between the two, we have solid black connectors on SO cables and black and white connectors on SJ cables. To make determining length of power cables easier on the job site, we mark each end with the actual length and cover the numbers with a piece of clear heat shrink so the numbers won’t come off. After all power is run, attention next turns to running the snake or digital network from the stage to front of house. If there’s also a monitor world, this is a good location for the stage box, helping to keep it out of the way. When there’s no monitor position, place the stage box on the side where the snake or network cable is run to FOH. 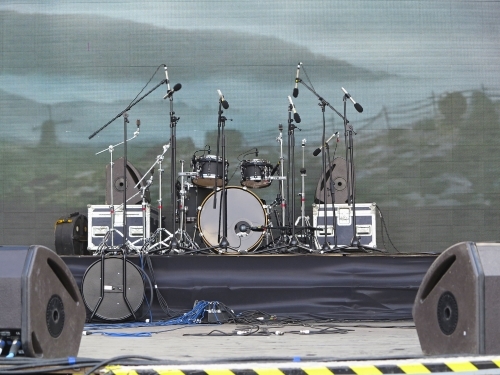 On corporate shows, locate an out-of-the-way spot backstage to place the stage box that will still be accessible during the event. Finishing up with snakes, attention next turns to monitor cables, particularly making sure that there’s enough cable slack to move the wedges after they’re positioned because changes are the norm. We route the monitor cables around the perimeter of the stage so the cables aren’t running across the performance area, minimizing trip hazards. Now it’s time for signal input cables. To reduce clutter, we have a few different lengths of cables to work with. My company stocks lengths of 6, 15, 30, and 50 feet, and to make it easy to grab the right-sized cable at a show, colored heat shrink indicates the length of each one. We also only mark the male end so there are no colors at the mic end that would draw attention to the cable, especially when on camera. With larger diameter loudspeaker and power cables, there’s enough room to label them with their actual lengths. On shows with a single band where there’s an input list that accompanies the stage plot, we may not actually label the individual mic lines to the stage boxes. 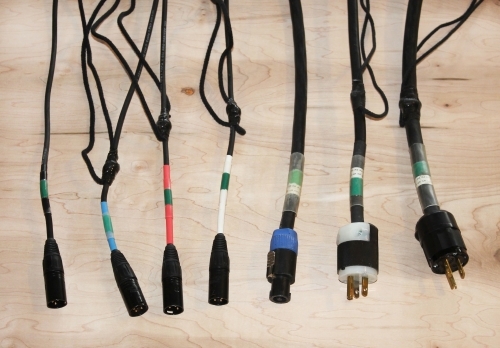 However, on multi-act gigs, we place a piece of gaff or electrical tape around the male end of mic cables, using it for labeling to help avoid any confusion among the multiple techs that will be working the stage. Always label every signal input and return on corporate events because there may be different techs in the room on different days, and the labels will make troubleshooting any problems easier. Unless all stage inputs plug directly into the console or a single stage box, we make a patch list of all inputs. It contains the input name, sub snake channel, main snake or stage box channel, and FOH and monitor console channels. On multi-act gigs, a patch list can be the difference between chaotic and organized set changeovers. With mics, we usually start in the order of the console. Channel 1 is kick drum with bands, so we begin at the drum kit. Make sure any stands used around a performer will not get in their way, especially around the kit. We stock both round base and tripod mic stands so we can grab one that will fit easily into the clutter of drum and cymbal stands on the kit. We also carry several clip-on mic mounts for snare and toms that can eliminate most mic stands around the kit. Before clamping anything to the drums, first get permission from the performer. Over the years we’ve found that sandbags come in handy, so we always have at least a few on hand. They’re a useful source of ballast for mic stands that need to be fully extended, like drum overheads. They also work well for holding doors open at load in/out and can help position a monitor wedge at a more optimum angle. Shorter XLR cables are used mike up the kit since we always locate a stage sub box nearby. Using shorter cables accomplishes two things: less cable clutter and less cable to wrap up at the end of the gig. When setting mics onstage leave some excess coiled at the bottom of the mic stand for easier repositioning if needed.